A red giant star will consume planets close to it, but leave others just right for life. When most stars reach old age and begin to run out fuel, they swell up to hundreds of times their normal size, engulfing planets that orbit too close. But can planets that escape this fiery demise still support life? In this state, can planets around the dying star host life? New research says yes. In about 7.5 billion years, the sun will have begun its march to the grave and will start expanding. Eventually it will swell to about 200 times its current size. It will swallow Mercury and Venus, and make Earth uninhabitable. But currently frigid locations in the solar system, like the icy moons of Saturn and Jupiter, might become just the right temperature for life. When the sun expands into a red giant, it will overtake the current orbits of Mercury, Venus and Earth. The planets will move away from the star as it expands, allowing Earth to just barely escape being engulfed. Earth currently sits in the "habitable zone" of the sun — the distance at which the planet is warm enough to have liquid water on its surface, but not so hot that the water evaporates. (Liquid water is a requirement for all life on Earth, although the universe could very well serve up exceptions to this). This "just right" spot around a star is also sometimes called the "Goldilocks Zone." The habitable zone is determined by the luminosity of a star — how much total light it emits over time. When most "normal" stars run out of hydrogen fuel, they start burning helium instead. Helium is a more potent fuel, and boosts the star's energy output at its core. As a result, the star swells up like bread in an oven, and becomes a "red giant." A graph from NASA's Kepler Space Telescope mission shows the size of red giant stars compared to the sun. A star's luminosity, or the total amount of light it emits in a given time, is largely responsible for defining the habitable zone. As a star swells up into a red giant, its luminosity increases. The sun's luminosity will increase by over 4,000 times when it becomes a red giant, the new research shows. "The Earth [will become] a sizzling wasteland. The sun [will be] nearly at the Earth's orbit. It's going to be crazy hot," Lisa Kaltenegger, associate professor of astronomy and director of the Carl Sagan Institute, told Space.com. Kaltenegger is a co-author on the new research, which appears today (May 16) in the Astrophysical Journal. But other places in the solar system will land in a less extreme temperature zone. The habitable zone of the sun will shift outward to include the orbits of Jupiter and Saturn, according to the new research. This infographic shows where the sun's habitable zone will be when it turns into a red giant. Under the thick icy layers on the surface of Saturn's moon Enceladus and Jupiter's moon Europa, scientists think it's possible that life could exist in liquid water oceans. The discovery of microbial life living in extreme environments on Earth, like under layers of ice in Antarctica, have boosted this hypothesis. The new research suggests that when the sun becomes a red giant, life on Europa and Enceladus could thaw out, and have a chance to thrive on a planet that would lie in the habitable zone, Kaltenegger said. For a star like our sun, a planet could potentially sit in the new habitable zone for half a million years. While that might not be enough time on a distant planet, that could be enough time for life buried under the ice to emerge and evolve into something detectable by Earth-based telescopes, Kaltenegger said. Around the most massive stars considered in the new work (those in the category "A5," which includes stars more massive than the sun, but not the most massive stars in the universe), a planet could potentially be in the "new" habitable zone for up to 200 million years. Big stars burn fast and bright, but small stars can smolder in the red giant phase for much longer. The new work shows that for small stars, a planet could sit in the red giant habitable zone for up to 9 billion years. If life can evolve on Earth in less than 4 billion years, why not on a planet around a red giant? Kaltenegger said she and her co-author on the paper, Ramses M. Ramirez, a research associate at the Carl Sagan Institute, have submitted a second paper for publication, in which they provide a list of 23 red giant stars within 100 light-years of Earth — potential targets for planet hunters. "I hope that this will actually spark an effort by people who look for planets, to also look at these old stars now," she said. "Because if you could find signatures of life on such an evolved planet — a de-frozen planet — that would tell you that (life) could get started subsurface, and that would be an amazing part of the story." Looking even further ahead, it could mean that humans could escape to the moons of Saturn or Jupiter when Earth becomes uninhabitable, she said. "People keep saying, 'When our sun becomes a big hot star, then we have to move to Mars or other places.' But really for the first time, we have actually calculated where that place is and when," she said. "If you want to go planet-hopping, you'll want to know when you want to be where, and that's basically what we figured out." This infographic illustrates how the habitable zone of a small red star will move out when the star expands into a red giant. Small stars remain in this phase of life longer than large stars, so planets in the "new" habitable zone can remain there for billions of years. To determine where the habitable zone of a star will move to be as the star evolves into a red giant, Kaltenegger and Ramirez used models of stars and their evolution that already exist. This made it possible to compute a star's luminosity, as well as its temperature, which also influences the location of the habitable zone. Planets that live in the habitable zone aren't necessarily habitable to life as we know it. Mars is a prime example. Venus lies just outside the sun's habitable zone, but its ultra-thick atmosphere traps heat on the surface and would likely make the planet uninhabitable, even inside the habitable zone. Still, looking for planets in the habitable zone is a good starting point in the search for life. Kaltenegger and Ramirez knew that there was one variable in this entire calculation that could render the rest of the research moot — if the star, as it expands into a red giant, strips all nearby planets of their atmospheres. "This is one of the things we didn't know," Kaltenegger said. In particular, she said the new work is the first time someone has shown whether or not rocky planets slightly less massive than the Earth and those slighty more massive than the Earth, could hold on to their atmospheres as their parent star evolves into a red giant. Stars lose mass when they become red giants, and that mass gets blasted outward, as part of the so-called stellar wind. 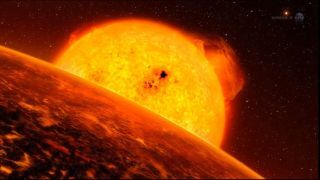 The new work shows that some planets will lose their atmospheres during the evolution — those located very close to the star, and those with low gravity (a planet's gravity helps it "hold on" to its atmosphere). But planets with sufficient mass, positioned a safe distance away, can maintain most of their atmosphere, Kaltenegger said. There were other complicating factors that needed to be factored in, such as the fact that as the star loses mass, its gravitational grip on the planets is reduced. As a result, the orbit of a planet around a star will expand as the star becomes a red giant. (For this reason, the Earth will escape being engulfed by the sun, according to Kaltenegger). Researchers have worked on the question of habitability around old stars before, but Kaltnenegger said no work has ever been done using models that can reveal details about how both the star and planets will evolve together through such a drastic change to the system. "This is the first time where we link the model of the star to the model of the planet and see what it does," she said. "The devil is really in the details. The first stabs at it were great work because the idea got started, but it's a lot of work to do, and [Ramirez] actually hunkered down and did it."